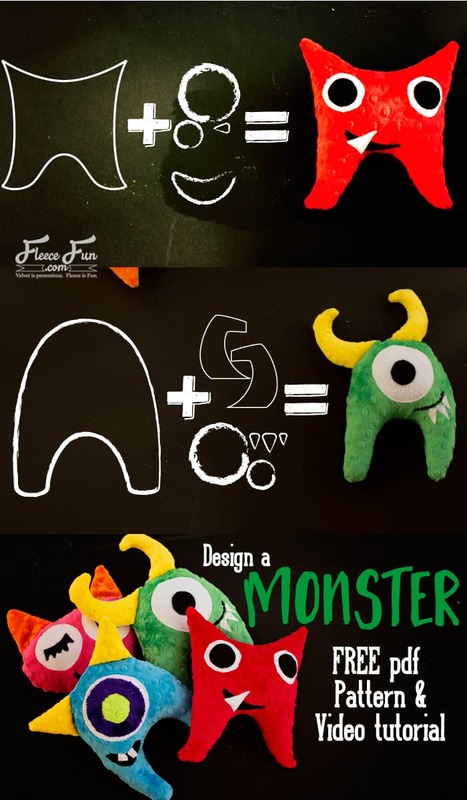 This Monster Softie Pattern free is the perfect little hand made gift for the little monster in your life. Easy to make, you get to design how you want the monster to look! Assemble the pattern. Now it’s time to design your monster! Choose the body, then the horns, then the eyes, mouth and teeth. Now choose the fabric that you want to use for each of those items. Next Cut out the pieces – cut two of the body. (check the nap of the cuddle to make sure it’s going in the same direction. Cut out the eyes, pupils, mouth and teeth. Note: you can use a circle cutter to make this part easier. Also feel free to free hand parts if you like! The pattern is only a suggestion. Assemble the eyes first. Temporarily adhere the inner eye to the outer eye using a glue stick. Sew on using a medium zig zag stitch along the edge. Repeat for the rest of the eye. Use this same method apply the mouth to the body and then the teeth. With right sides together and plastic on the outside sew the horns together using a .5 inch seam allowance. Clip ends to make sharp points and turn right side out. Stuff with a little batting if desired. Using a.25 inch seam allowance baste the horns in place to the body. Using a .25 inch seam allowance. With right sides together sew the front of the body to the back, leaving a 3 inch gap for turning. Clip the curves and corners. Turn right side out and stuff. Hand sew the gap shut. You just completed the Monster Softie Pattern tutorial!